Looking for a getaway that’s close to home? In this eclectic city, there are always events, festivals, shows, and entertainment to keep you busy during the day. Between activities, you can experience dishes inspired by the flavors of Belgium, Spain, Vietnam, India, Italy, Mexico, Americana barbecue, and beyond. When you get thirsty, locally brewed beer, hand-crafted cocktails, and a wide-range of local wines are sure to delight and inspire your palette. And in the mornings, you’ll enjoy the smell of roasting coffee wafting from downtown, welcoming traditional and pour-over fans alike. To truly experience all the events, festivities, and flavors Goshen has to offer, you may need more than just one day! Luckily, there are many locally owned hotels and bed and breakfasts to make your stay as comfortable as possible. Once you arrive, we recommend walking or biking on Goshen’s many lush nature trails and bikeways to fully experience the Maple City – and, of course, to work up an appetite! South Bend Regional Airport (SBN) is located about 45 minutes from downtown Goshen. A little further out is Chicago’s O’Hare (ORD) or Midway (MDW) – Goshen is about 2.5 hours from Chicago. Other airports within 100 miles include Kalamazoo/Battle Creek International Airport (AZO) and Fort Wayne International Airport (FWA). The South Shore Line runs from down town Chicago to the South Bend Regional Airport for around $10. If you are coming from another major city in the Midwest, check the Amtrak site for lines going to Elkhart, Indiana. 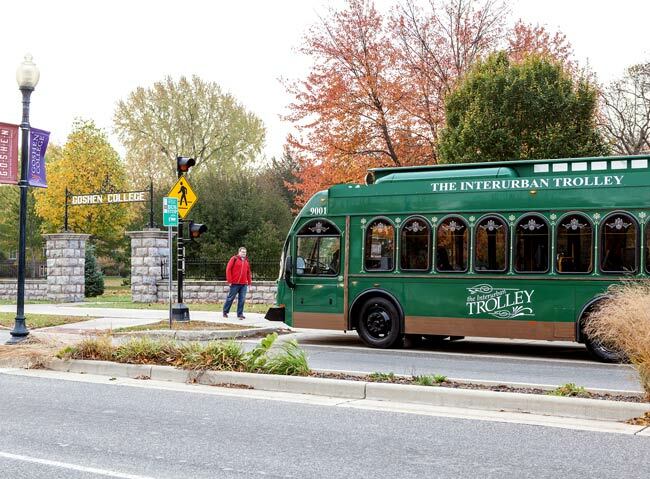 Take the trolley – you can plan your trip and find routes here. Take the Bristol exit, which is also State Road 15. Follow State Road 15 south approximately 10 miles until you get to downtown Goshen. (From the northwest) Follow U.S. 33 into the town of Goshen, where it will intersect with State Road 15. Take State Road 15 south until you see the bright lights of Goshen. (From the southeast) Follow U.S. 33 to College Avenue. Turn left on College Avenue and continue one mile State Road 15. Turn right on State Road 15 and continue for another mile to downtown Goshen. At the intersection of U.S. 20 and State Road 15, take State Road 15 south 7 miles to downtown Goshen.